Peter Brigg is certainly one of the most influential fly anglers in South Africa. He has become a popular fishing companion for many who visit the KwaZulu Natal province to fish the famous Drakensberg rivers. I have also spent a day fishing with Peter Brigg on the upper Bushmans River in the Giant’s Castle Nature Reserve and can vouch for his superb fishing skill with a fly rod; that is, besides his delicate fly tying skills, intricate writing and talent with pencil and pastel, with which he creates some of the most detailed fishing and wildlife sketches I’ve come across. 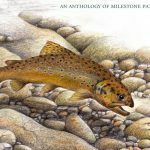 This post is dedicated to Peter and includes a brief description of the reserved road he walked to becoming a fly fishing legend in our country. “Someone said to me the other day after relating a story of a hiking trip that happened 30 years ago – “reminiscing is a sure sign of age” – I guess that is right. But then I’m entitled to if I look at it from the point of view that I’m only a couple of years shy of three score and ten, have been around the block a few times, met many people, learnt from my mistakes, experienced the good and the bad and hopefully gained a sprinkling of wisdom. When I look back over my life, I realise how blessed I have been in so many ways that have allowed me to pursue my interests in the outdoors, the natural environment, hiking, photography, writing and art, all of which are bonded by the common thread of fly fishing. 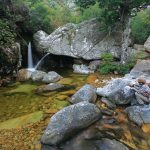 If I look for a starting point and earliest recollections, it goes back to 1954 when I caught my first small rainbow trout in the headwaters of the Buffalo River in the Amatola Mountains, a short drive from King William’s Town in the Eastern Cape. With supportive parents and the help of a keen flyfisherman family friend, the desire and enthusiasm spark was ignited and continues to burn with the same intensity today as it did all those years ago. My parents who were salt of the earth people and who sacrificed much to enable me to fish, also instilled in me a love of nature and discovery, of always wanting to see what was around the next bend. As a youngster it was not just fly fishing that captured my imagination, but any form of fishing from worms in freshwater to red bait in the sea along the Transkei Wild coast. In my teen years in the Eastern Cape the stomping grounds of Sydney Hey in his classic book, The Rapture of the River became my home waters. Every opportunity was spent following in Hey’s footsteps along the rivers of the Amatola Mountains and around Maclear. In the late 1960’s I married my wife Colleen, moved to Westville in KwaZulu Natal – we had three children and for a period while they were at school my fly fishing was relegated to the back burners with just occasional sorties when circumstances and time permitted, much of it on the fabled KZN stillwaters. It was during this period that I met my great friend John Hone MD of Art Publishers and together with mutual friend Dave Osborne, conservator at Monks Cowl in the Cathkin valley, my hiking in the Drakensberg began in earnest. Apart from annual 10 day hikes along the escarpment, many shorter hikes were undertaken scrambling across the length and breadth of this mountain range, photographing its landscapes in all its moods. John was the consummate professional photographer – it was this friendship that stimulated my interests in photography and raised it to new heights. On one of our hikes in the Mnweni area we were forced off the mountain by severe weather conditions and ended up exhausted, cold and hungry at a foresters house near Cathedral Peak Hotel in the early hours of the morning. Why do I mention this? Well, it was here that my art journey began. The forester, Chris Maartens was an outstanding bird artist. It was his work in pastels that prompted me to try my hand at it. Up until then I had dabbled a little with pen and ink, but had never taken it too seriously – the rest is history and now most of my work specialising in birds is done through commissions, although I have recently branched into other areas of the natural world including fish. My hiking took me deep into the mountains, often along the upland streams seldom visited by others. It was then that I realised the potential to combine my passions of hiking, hunting wild trout in small pristine streams, photography and inspiration for art. I have been fortunate to have shared much of this with likeminded friends over a period of some 30 years – countless adventures, experiences and memories. It was about 15 years ago that I first tried my hand at writing. My Dad was the linguist in the family, with a very good command of the English language. I on the other hand was not very good at the finer points of the language and in fact found the subject boring. Somehow though, a little of what I was taught must have been subconsciously absorbed by my grey matter although writing still doesn’t always come easily. 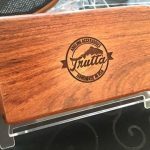 Tom Sutcliffe and also Ed Herbst have not only been a great inspiration for my fly fishing, but Tom in particular for my attempts at a writing in a simple, no frills conversational style. I have written numerous articles for local and overseas fly fishing magazines in the UK and USA and more recently for Country Life. These interests resulted in the birth of an idea to publish a book – Call of the Stream was published in December 2008. It was the culmination of a 3 year project, but with photography and research stretching back many years before that. I wanted it to be more than just another coffee table book with detailed technical instructions on how to fly fish. Instead my goal was to create something visually attractive, informative and easy reading. I wanted it to relate a little of my fly fishing journey, some historical information about trout acclimatisation and thoughts based on my experiences fishing small streams – it is an album of images that hopefully evoke the ambiance of the diminutive and captivating world of small stream fly fishing, celebrating the moods and settings in all their rich diversity. My most recent project is a new book that will be a chronology of fly patterns that by way of their design, materials used and tying techniques can be considered unique to South Africa. Ed Herbst who is a fountain of knowledge agreed to co-author the book with me. If all goes according to plan, it will be published in 2015. PS – Peter can be contacted on brigg.peter1@gmail.com for inquiries about his work or for book orders. You’re amazing Peter, wow and wow again! Well done and thanks for sharing your gorgeous art work with us! Uncle Pete you are so incredibly multi talented . I have such fond memories of your hikes in the Drakensberg with John Hone and my dad, and I remember the excitement, the build up to the hikes and the debriefing tea sessions once you were back. Such incredible memories. !!! flies from your fly shop. fishing flies in all types of patterns. to send samples for you to see our workmanship. maintain good working relationship and honesty with you. We shall also service your orders in a timely manner. We eagerly await to hear from you as soon as possible. Any chance you have prints for sale of the trout painting featured above?